Smartphones are all the rage right now, and whether they’re running Android Wear, Pebble’s bespoke operating system or whatever it is that Apple has running on its Apple Watch, all are running a modern operating system that’s designed to do the job. Whether it manages it or not is very much a matter of opinion. If you have a Samsung Gear Live wrapped around your wrist then it turns out you’ve got a little more choice than you may have first thought after video popped up online that shows a rather surprising OS powering it. Having already been treated to a version of Minecraft PE and Doom running on an Android Wear device, we’re now in awesome position of witnessing Samsung’s Gear Live running arguably our favorite version of Microsoft’s Windows to date, Windows 95. Of course, and as you might expect, performance isn’t exactly stellar here and running apps causes the watch to run out of memory. But that’s not really the point here, is it? 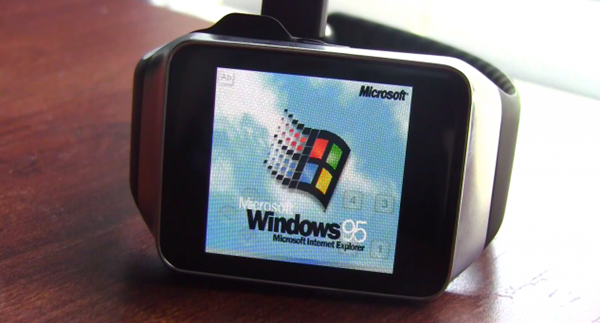 Just the thought of Windows running on a watch has us giggling like kids, and if you’d told us that would be possible back when Windows 95 launched in, well, 1995, we’d have called you a great big dirty liar. Now we’re just left wondering what else people can get to run on a watch or, even better, what Windows 95 will pop up on next. This is not a real port, it’s just an app that emulares DOS environment !!!! I bet this guys don’t know the difference.